Scientists are still determining which of the mammals in this picture is more fuzzy. 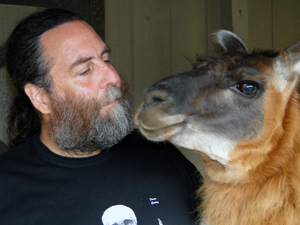 Either way, you win: it's a picture of a bearded Matt Ravosa with a llama. Not Jaws the shark, mind you - jawbones. Specifically the jawbones of mammals, like, say, humans. Or llamas.